At the outset of the clothing workers' strike in January 1913, strikers noted that lights were on at this subcontractor’s shop, so they pounded on windows to call the workers out. The proprietor grabbed a rifle and shot into the crowd, killing 18 year old Ida Breiman, a striker whose father was a member of the Brotherhood of Tailors. Several thousand marched in a funeral procession two days later. 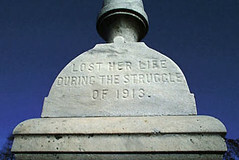 Ida was buried at the Stone Road Cemetery; a monument, erected by the Brotherhood, reads simply: “Ida Breiman - Lost her life during the struggle of 1913.” Following the murder, public sentiment was with the strikers; soup kitchens were formed and relief collections made. 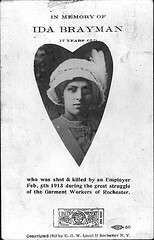 Finally, though, the United Garment Workers called the strike off on March 20, 1913.